Upcoming kicking camps in 2 new locations this summer at University of North Texas- Fouts Field in Denton, TX and Tempe High School in Tempe, AZ. For our afternoon session the kicking camp is designed more as a college kicking camp where students will learn advanced field goal kicking and kickoff techniques to help propel their skills to another level. By the completion of the camp students will learn how to add at least 3 more yards to their kickoffs, understand the proper way to aim on field goals and minimize chances for errors, the proper follow-through on kickoffs (which are different from field goals), learn strategies to deal with the ‘mental game,’ and also become more poised and confident in pressure situations as we will be having various head to head kicking competitions, knock-out competitions, last man standing kicking competition, pressure-drills, and last-second game winner drills. If you are a middle school kicker or a high school kicker and are looking to dramatically improve and become a college kicker, this special college kicking camp afternoon session is for you! In addition to all the fine instruction you will receive, we will also conduct a special 30 minute presentation from 11:30am-12:00pm (which is open to ALL football players, coaches, and parents, not just kickers & punters). In this discussion Coach John Baker and/or myself will teach you the secrets you need to know about the college football recruitment process, how to gain exposure to college coaches, how to best prepare your marketing materials which include items like your kicking highlight video, athletic resume, letters of recommendations from coaches, kicking coaches, and teachers, and how to show the coaches you mean business and you are the BEST choice for their program. Remember, having a successful collegiate football program is a lot like running a good business; coaches pick the best men for the job and things become much more serious after high school… are you ready for the challenge? do you have what it takes to play at the next level? Do you dream about suiting up at a big D1 football program in front of tens of thousands of people? If so, visit our website at https://www.kickingworld.com/ and give us a call so we can help get you on track today! 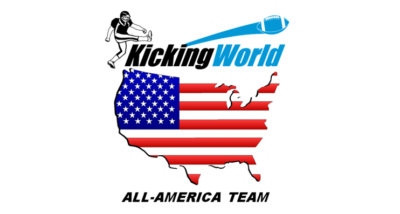 Sign up for one of our kicking camps or call us to schedule private kicking lessons or private punting lessons in California or New Jersey or after one of our national kicking camps this summer in Texas, Arizona, California, or New Jersey.